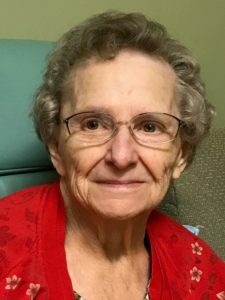 Leta Clifton Ferrell, age 82, of Kenly, passed away on November 7, 2018 at the SECU Hospice House in Smithfield. Born in Johnston County on September 14, 1936, she was the daughter of the late Ulas Calvin and Laura King Clifton. Mrs. Ferrell was a loving wife, mother, grandmother and sister. Funeral services will be held on Saturday, November 10, at 2:30 PM in Creech’s Primitive Baptist Church with burial following in the church cemetery. The family will receive friends at Parrish Funeral Home in Selma on Friday from 7 to 9 PM and at other times at the home located at 9564 NC Hwy 42, Kenly, NC. Surviving are her husband Donald Elbert Ferrell; son Tony “Buzz” Creech and wife Karen of Clayton; daughter Kelly C. Narron and husband Tim of Wilson; step-daughter Donna Ruiz of Princeton; brothers Raymond Clifton of Garner and Leamon Clifton of Angier; sister Maverine Baker of Garner; grandchildren, Janie Narron, Danielle Webb, Miranda Creech, Brianna McCain, Kyle Lynn and Jalen Lynn; and great grandchildren Parker Webb, Wyatt Webb and Laura Lynn. Flowers are welcome or memorials may be made to the SECU Hospice House; make checks payable to Johnston Health Foundation, PO Box 1376, Smithfield, NC 27577.